In the midst of a particularly stressful and trying period at work, the last thing I wanted to do on a cold, clear Saturday morning was give up my warm bed to go hiking. Significant Other was having none of it and pried my fingers from the blankets and made sure I was dressed and ready to go about an hour later. We parked at Kirstenbosch‘s Rycroft gate, paid our entry fee and set off on our hike. As soon as we started we ran into a security guard who had on a previous occasion escorted us, pleasantly but firmly, off the Kirstenbosch premises when we wandered in by mistake. On that trip we had walked over from Cecilia Forest but couldn’t find the path to the left that should have taken us up to the Contour Path on the way to Skeleton Gorge. The gentleman popped up out of nowhere, asked for our tickets (which we didn’t have since we had no intention of visiting the Gardens that day) and then was so kind as to walk back with us and show us the correct way. On this trip we (legally) walked along the paths on the south western side of Kirstenbosch and followed the signs to Nursery Ravine/Skeleton Gorge to bring us onto the Contour Path. (It must be mentioned that I was still rather glum at this point and not amused at trudging up the dusty paths just outside Kirstenbosch). Shortly after getting onto the Contour Path, a signpost points towards Rooikat Ravine / Cecilia* Waterfall and the scenery starts improving. It goes without saying that this route is uphill all the way… We took a breather on some large rocks on a bit of a shoulder, had some energy giving sweets and biscuits and some water, and my mood started to lift as I looked at the fynbos around me and the Southern Suburbs spread out like a toy town below. From this point the climb up the ridge starts in earnest. Don’t be put off by the word ‘climb’ though – this is one of the easier ways to get onto the Back Table. It’s quite steep and a bit eroded here and there, but with a steadying hand from Significant Other it presented no real problems. One scrambling section not far from the top stands out in my mind, but it was not scary in any way except perhaps for Significant Other who stood at the bottom and had to gaze upon my inelegant attempts to hoist myself up. The problem was that I first got my daypack and then my hips wedged in such a way that I couldn’t raise either of my knees to take the next step. (Maybe my slightly-tight-around-the-tush trousers also had something to do with it). But after some maneuvering I eventually popped out the top and was ready to carry on. Soon after this scrambly bit the path evens out quite a bit and it is really stunning up there. The vegetation is lush and the views stretch all across the Southern Suburbs. Vlakkenberg and Constatiaberg seem within touching distance, and the southern hills of the Table Mountain range disappear into the distance. The path skirts to the left just below the top of Cecilia Ridge, topping out at about 680m, from a starting point of about 200m at Rycroft Gate. The section between the last scramble and where the path joins the cement track, (a.k.a Clayton’s Road according to the maps) is my favourite section of this hike. 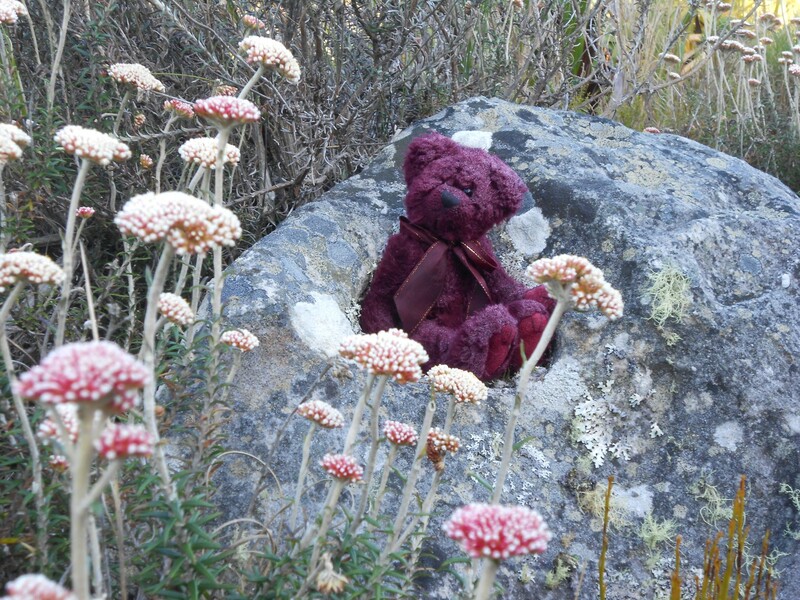 It’s cool in the shadow of the hill, there’s fynbos all around and birds and insects everywhere. At the cement track we turned right as far as the Overseer’s Cottage, then turned left again to take in De Villiers, the southern most of the five reservoirs on top of Table Mountain. The reservoirs on top of Table Mountain never fail to amaze me. Huge masonry walls hold back the large amounts of water and one can’t help but marvel at the level of engineering skill and sheer strength it must have taken to build them. 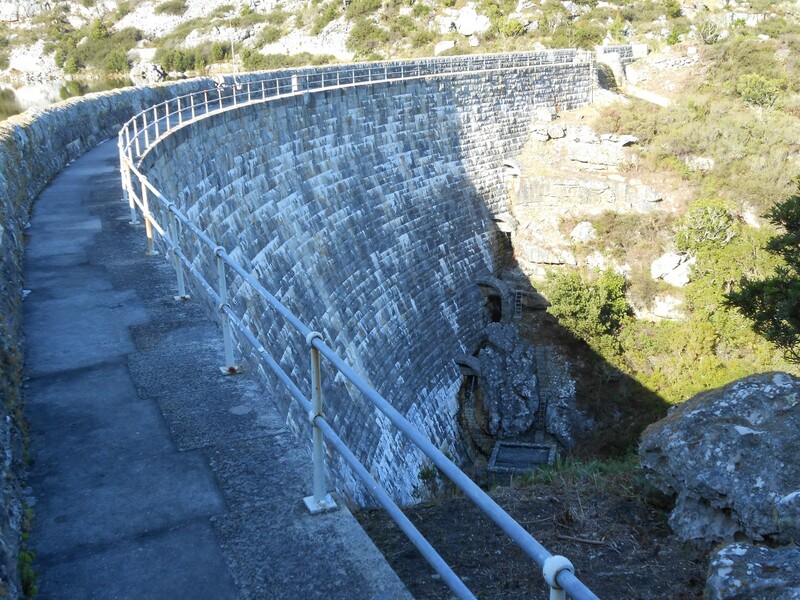 The first to be built was Woodhead in 1897, and over the next ten years one after the other was added as the demand for water in Cape Town kept outstripping supply. There are five in all, with De Villiers being the last to be completed in 1907. In winter they are usually full to the brim, but in summer they can represent an eerie moonscape for the unsuspecting. For those interested in the history of the reservoirs, be sure to visit the small Waterworks Museum next to Hely-Hutchinson Reservoir. 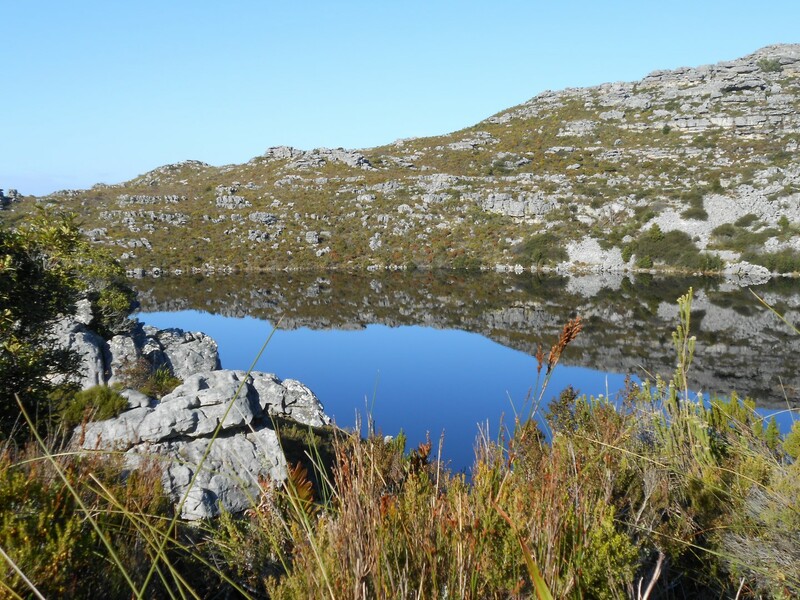 At the top of the mighty wall of De Villiers Reservoir we stopped to enjoy the balance of our sweets and chocolate and gaze across the perflectly still waters. It seems so far from everything, yet dog walkers and trail runners are doing there thing not more than 300m away. Quite a special spot. 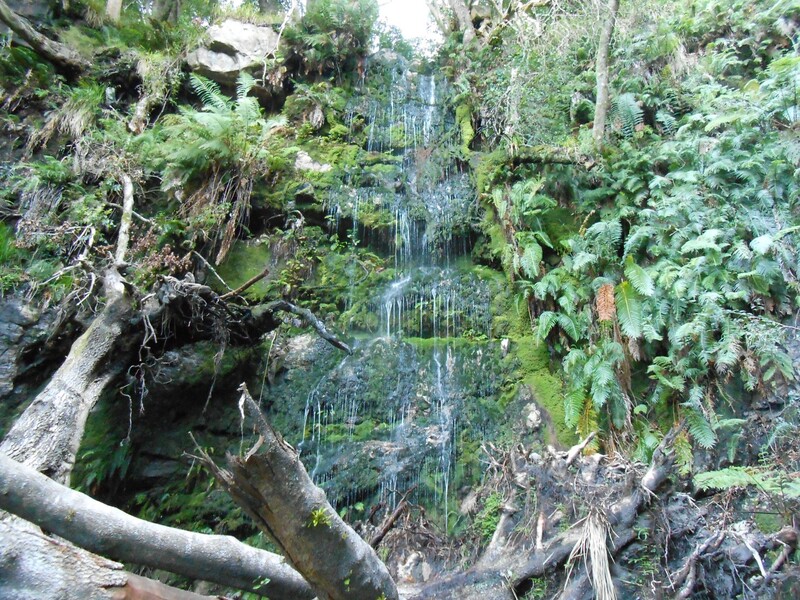 There are many choices for a route back to Kirstenbosch, and we decided to take the cement road and bridle path down, turn left towards Spilhaus and Cecilia Ridges, and to take in Cecilia Waterfall. From the cement road and bridle path one gets impressive views of Cecilia Ridge, which I felt made it look far steeper than it actually was. In summer this is probably just a trickle, but on our hike in July Cecilia Waterfall was showing its splendour. An ideal spot for a break before tackling the final up, down, up and finally downhill all the way to the start of the hike. The Waterfall path rejoins the upward route at the shoulder where we had our first break. 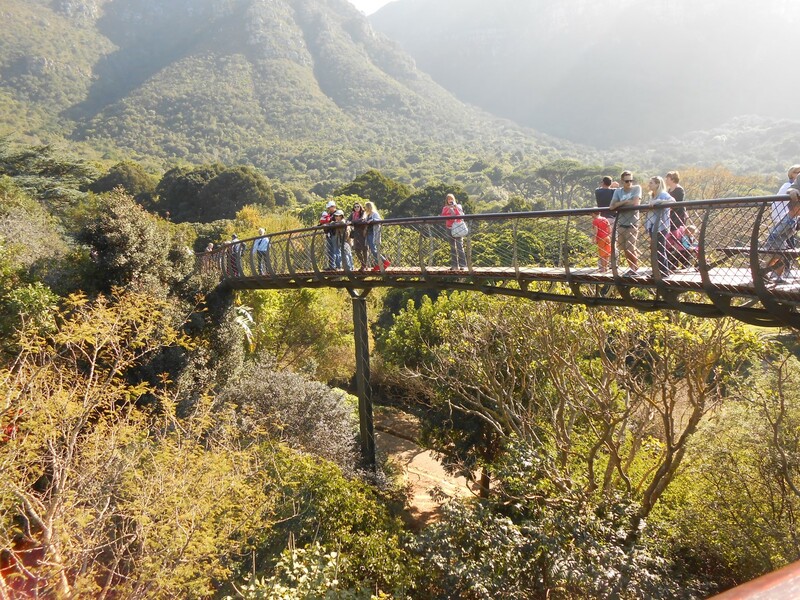 It was barely lunchtime by the time we reached the the paved paths of Kirstenbosch again, and as legal ticket holders (this time) we decided to visit the newly launched Boomslang (Tree Snake). This is the nickname of Kirstenbosch’s Tree Canopy Walkway, 130m of twisting steel and wood, reaching three storeys above the ground. It took us a while to find it but it’s quite a marvel. Since the sun was out for the first Saturday in weeks, everyone who’s anyone seemed to be on the Boomslang. The wider viewing areas were busier than a shopping mall, which also means it swayed as if a giant snake charmer was at work. This is apparently part of the design and they do mention it on the info boards. Nonetheless I was glad to be back on terra firma and out of the crowd. But well worth another visit some time. 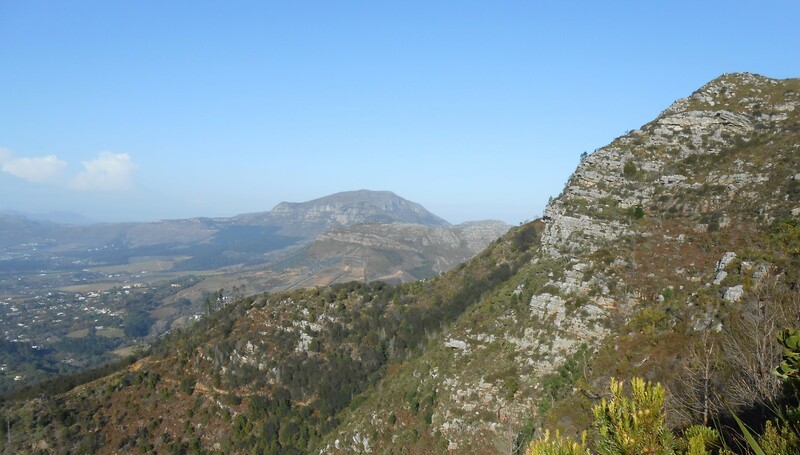 Get there: The hike can be started from either Cecilia Forest on Rhodes Drive near the intersection with Hohenort Avenue (no entrance fee into Kirstenbosch payable), or from Kirstenbosch itself. We parked across from Rycroft Gate on the corner of Rhodes Avenue and Klaassens Road. Entry fee is payable, but you get to enjoy the gardens as part of the day out. Time – 2,5 hours round trip. Add some additional time for breaks and to visit the reservoir and waterfall. 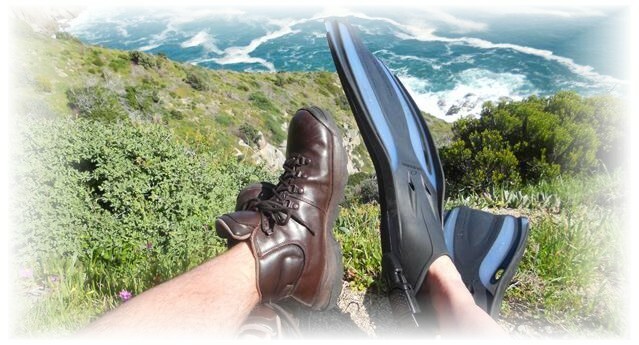 Don’t forget – camera, snacks, water, sun hat and sunscreen, warm jacket and rain gear, entry fee into Kirstenbosch Botanical Gardens. * Cecilia was not the daughter or wife of a gentleman of the 19th century Cape Colony as one might expect. These place names all refer to Cecil John Rhodes, the famous statesman and businessman. In his will, he left large areas of land on the slopes of Table Mountain “to the South African people”. Kirstenbosch and UCT are situated on parts of this inheritance.